I arrived late due to the traffic. No quiero quedar en casa. Por eso voy a la ciudad. I don't want to stay at home. Therefor I'll go into town. Estudié español por tres meses. I studied Spanish for three months. Nos vemos mañana por la tarde. We see each other tomorrow in the afternoon. Hay muchos turistas por aquí. There are many tourists around here. Anduve por las calles del Albaicín. I walked through the streets of Albaicín. 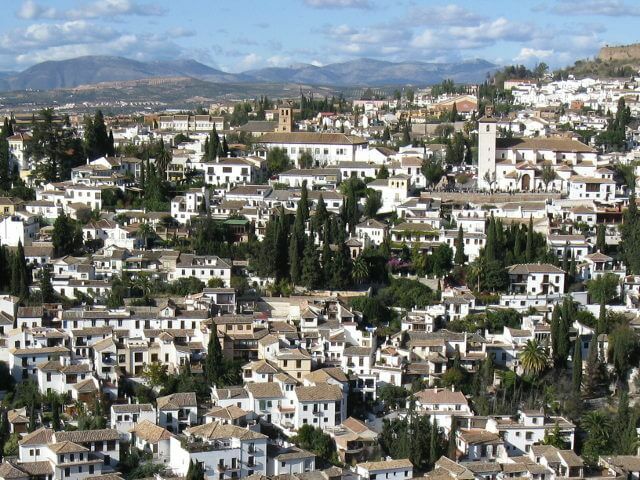 Vamos a Granada por Jaén. We go to Granada by Jaén. They pay me per hour. Compré este coche por mil euros. I bought this car for thousand euros. I want to change it for another one. En este sitio hay mucha información para aprender español. On this site is much information for learning Spanish. What do you need the knife for? Lo necesito para cortar la carne. I need it to cut the meat. Salimos para Bolivia la semana que viene. We leave for Bolivia next week. Este regalo es para Rafa. This present is for Rafa. Necesito el artículo para el lunes. I need the article by monday. Mi primo trabaja para el gobierno. My cousin works for the government. We go to the south. We go through the south.